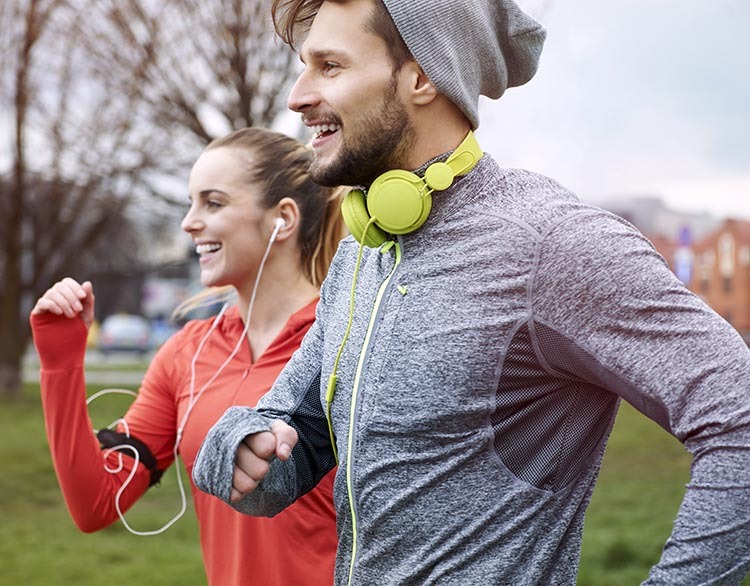 Many runners love to wear headphones, and no wonder – it’s a scientific fact that music motivates people to exercise harder. Plus, headphones really help with the boredom factor. So it’s no surprise that so many runners wear headphones. But with the huge range of choices, how do you pick the best and safest headphones for runners? 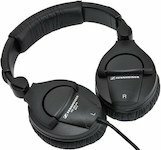 There are a lot of posts about how to pick the best headphones. Those posts focus on sound quality. This post focuses on how to stay safe while running. Do safe headphones for runners and pedestrians even EXIST? If you plan to run on public streets, you are going to be at risk of being struck down by people driving motorized vehicles. While the vast majority of motorists try extremely hard NOT to kill people, there will always be motorists out there who are distracted/hunting down a Pokémon/drunk/high/texting/eating breakfast/oblivious/fleeing police pursuit/too young to be driving/too old to be driving/grieving/angry/having a heart attack … you name it. Bottom line: if you want to avoid being killed by distracted drivers, it just makes sense to think about safety first and choose the safest headphones for running. Below is a table comparing our pick for the 6 safest headphones for runners, followed by an explanation of the rating. Non-immersive headphones are especially designed not to exclude the sound around you. They were designed for runners in mind, and offer a fairly good compromise. They fit into your ears, but are designed so as not to cut out all other sound. What Else (apart from Safety) is Important in Choosing Headphones for Runners? First of all, the headphones should not actually be headphones at all. Technically, headphones are those huge things that you wear right over your head. Those would be way too bulky and hot for most runners. Headphones on the left, earphones (or earbuds) on the right. Technically, headphones are those huge things that you wear right over your head. Those would be way too bulky and hot for most runners. No wonder the male runner has taken the headphones off his ears! What runners really need are earbuds – those little things that you place right inside your ears. However, in practice most people call those things headphones too, so this post often refers to them as headphones. However, we are only looking at earbuds. I know this is a classic First World Problem, but boy, do I find it annoying to have earbuds falling out of my ears while I am trying to work out! Of course, getting super annoyed is the exact opposite of what I am trying to achieve with exercise (Zen-like peace and serenity, like I feel after a whole bottle of wine, but without the hangover). So yes, fit is very important. 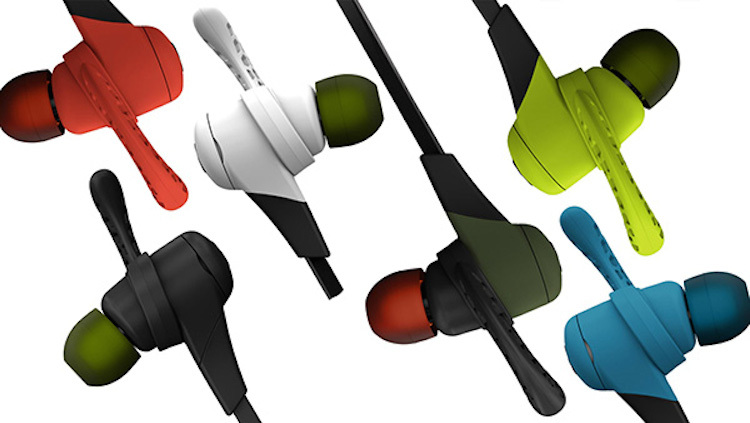 This is why this post focuses on earbuds that are designed to be SPORTS headphones. Generally, these have one or other feature that ensures they stay in your ears. For example, Jaybird X2 headphones have little fins to hook them into your ears. Most runners sweat, and some of us sweat a LOT. Sweating pretty much comes with the territory of running. So you need running headphones that are immune to quite a lot of moisture. Running is a pretty hectic activity, so you want headphones that will not fall apart the first time you drop them or sit on them. They need to stand up to being carried around in gym bags, and just generally, a lot more wear and tear than your average headphones that never leave the home or the office. Most runners like their runs to be as free and untroubled as possible. Having to deal with threading a headphone cord through your clothes is an additional hassle that many runners prefer to do without. On the other hand, Bluetooth functionality is going to add to the cost of your headphones. Based on all these factors, here are my top choices for the safest headphones for runners! These headphones were developed by Sennheiser and Adidas working together, so you would expect good results. 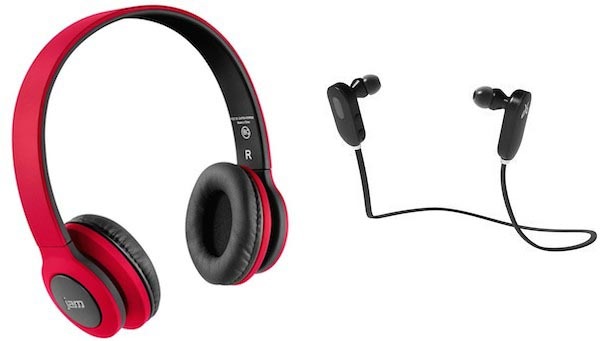 And these are pretty amazing headphones for the price. The Sennheiser OCX 685i Adidas are specifically designed for running outdoors. For that reason, they are kept in place by soft silicone ear hooks. These headphones make the list because they don’t fall out, they are popular and cheap, and have a reputation for being tough. They also have great sound, at an amazingly low price. So why are they at the bottom of the list? Six words – from their own promotional copy: “Ear canal fit blocks out background noise.” Yeah … now what about that is safe for runners? Strictly tread mill only, as far as I am concerned. Also, they are only water and perspiration resistant, not guaranteed sweat proof. Oddly, my no. 5 choice actually has by far the best sound quality of all the headphones that beat it into fifth place (except arguably the Jaybirds X2, which some people prefer). 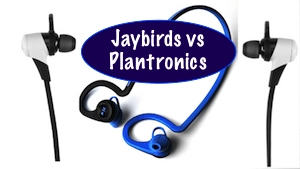 Here’s a post that compares Dr. Dre Powerbeats 2 vs. Jaybird X2. 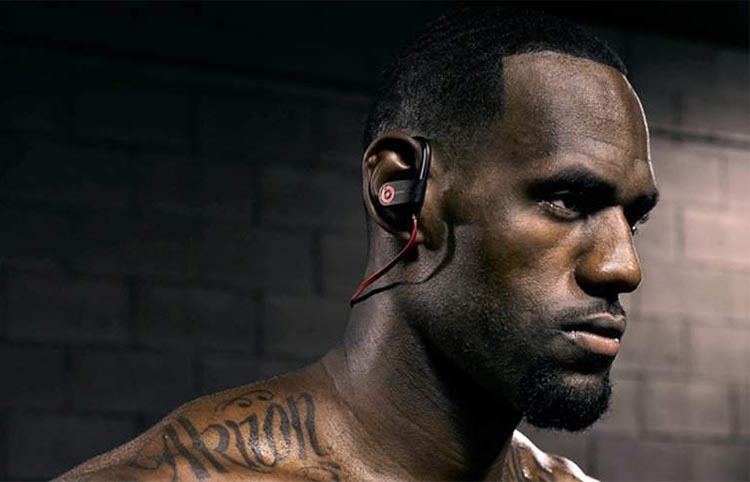 Dr. Dre Powerbeats 2 make this list because they are probably the most famous and popular sports headphones in the world, and because they have truly awesome sound for such tiny headphones. And because they look good. More importantly, they are sold as sports headphones because they are tough, water-resistant and stay on. And they really do stay on. 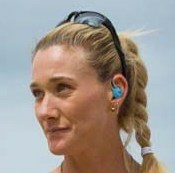 The over-the-ear design with bendable ear hooks ensures you can run without any fear of losing a bud. Plus, they are guaranteed sweat-proof. Also, a very big plus, they are cordless (Bluetooth). Not having to deal with cords makes for a much more hassle-free run. The Powerbeats 2 differ from other Beats headphones in that they are deliberately designed not to seal in your ear. Hence, they tend to rest on your ear canal, rather than on them. Of course, this means that you can hear important sounds such as a car horn. However, you have partial hearing, not full hearing. However, they are at the bottom of my list because their electronics are not impressive compared to other headphones in the same price range. And also because I personally do not find only partial hearing to be safe enough. A lot of people do, but I do not. 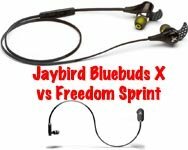 Jaybirds X2 are great sports headphones, and very highly rated in terms of being able to stay in your ears. There’s a full review of the Jaybirds X2 here. I love that the new Jaybird X2 come in black, white, grey, green, red, blue – a big step up from the black or white of the Jaybird X Bluebuds. Jaybirds X2 have a lifetime sweat guarantee, and are pretty much impervious to even the sweatiest head. They come with little ear fins to help keep them in your ears. They rank above the Sennheiser OCX 685i Adidas because of their very high waterproof factor, plus the fact that Jaybirds X2 are very specifically designed to let in ambient noise, and do this pretty well. Also setting them above the Sennheisers is the fact that excellent Bluetooth connectivity makes for a hassle free cordless experience. Jaybirds X2 are rated above Powerbeats 2 because they have truly awesome onboard electronics, enabling you to easily control them while you are running. Finally, Jaybirds X2 are rated above Powerbeats 2 because they have truly awesome onboard electronics, enabling you to easily control them while you are running. All of these factors make the Jaybirds X2 a better choice than the Sennheiser OCX 685i Adidas or the Powerbeats 2. Plantronics BackBeat FIT are good looking, TOTALLY WATERPROOF (you can shower with them), very tough and rugged, soft and comfortable to wear, and designed to let in ambient sound. Their onboard electronics and Bluetooth are both absolutely top notch, with a pleasant voice and tiny controls keeping you in control all the time. 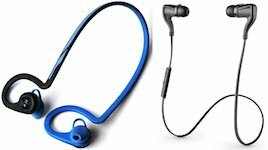 The Plantronics Backbeat Fit headphones come in blue, green, and red. Everyone who knows me knows that I wear Plantronics BackBeat Fit headphones almost all the time (even in the shower now), so I may be a bit biased! 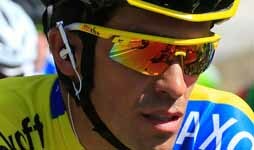 However, I don’t wear them when I am running or cycling – then I switch them for the headphones that I have rated as no. 1. Still, Plantronics BackBeat Fit are awesome sports headphones. Aftershokz Sportz Headphones use bone conduction technology to provide a way to listen to music while still keeping your ears open to ALL of the sounds around you, while hearing your music through your cheekbones. 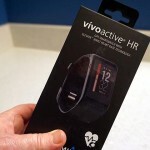 This makes them ideal for runners who want to listen to music while still being safe and aware of their surroundings. Aftershokz Sportz Headphones use bone conduction technology to provide a way to listen to music while still keeping your ears open to ALL of the sounds around you. Note in the picture how the ears are not covered at all. The Aftershokz headphones are modeled by Maggie, my long-suffering wife and co-blogger. Billed as offering a safe, comfortable, responsible open-ear experience, these Aftershokz Headphones are pretty much perfect for runners. The overall quality of these headphones is simply amazing for cutting-edge-technology headphones that cost less than $50 at Amazon. Of course, the sound quality is different – you are hearing music via vibration instead of sound waves, so it is a different experience. I am not going to tell you the sound is just as good as with in-ear buds, because it is not. However, it’s a compromise I am willing to make for safety while running. 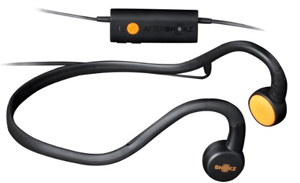 Using the Aftershokz headphones while running is much like listening to the radio in a car, with the windows open. Your ears are still 100% open to surrounding sounds. I do find there were times when the traffic noise tends to drown out the headphones. By keeping your ears open, you are in a situation where different noises are competing. 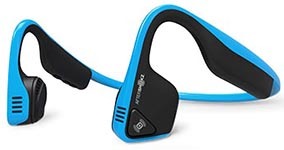 These rank #2 because they offer a cheap way for runners to enjoy music safely. 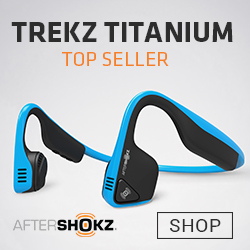 The brand-new CORDLESS Aftershokz Trekz Titanium Bluetooth open ear bone conduction earphones are easily my top choice for the safest headphones for runners. As with pick #2, Trekz Titanium uses bone conduction technology and therefore will not give you the same audio fidelity and quality as regular headphones. In fact, many critics point out that all headphones that use bone conduction have intense treble and very little bass. This is true. However, I am focusing on safety. I would rather keep running with too much treble, than be run down with my head full of bass. What puts Trekz Titanium at no. 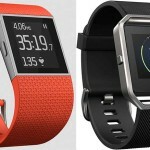 1 is that they are Bluetooth, so there are no cords – making them just that much easier and safer, as there is one less thing for runners to worry about. Also, these headphones have a brand-new titanium frame. Trekz chose titanium for strength, durability, and extreme flexibility. It took me a little while to get used to them, because the titanium is stiffer than rubber. Most of the time I hear my music just fine, and the quality of the sound is totally acceptable to me. I don’t even remember that it is bone conduction while I am wearing them. So that’s it – my top choice for the safest headphones are the AfterShokz TREKZ Titanium Open-ear Bluetooth Headphones for two key factors: my ears are open to listen for motorized vehicles and bicycles, and there are no messy cords to complicate things. But that’s just me – ultimately, you need to balance how much you value audio quality vs. safety, decide what you are comfortable with, and buy accordingly. Good luck! Thank you for sharing the article, it was very informative. It is really necessary to select the appropriate headphones for runners, otherwise, it may cause serious issues. I agree that selecting the headphones that provide safety are really important, and of course the ones that are comfortable. With so many options available, one can go for affordable full size headphones that have a proper fit, let all the external sound in, and also that are wireless. 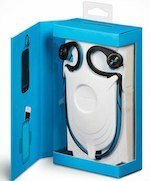 I have a friend who got a pair of wireless, bluetooth headphones from http://www.soundmagic.us/ and uses them while jogging and exercising in the gym. The ones operating on bluetooth are the best since they provide ease of use, and do not restrict the body movement which is very essential.